Incoming book alert! 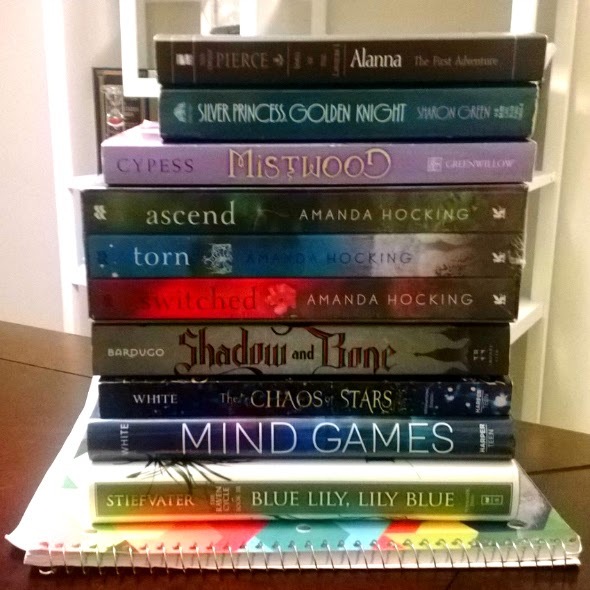 Check out all of these unused books I purchased for only $30 (excluding Maggie Stiefvater's Blue Lily, Lily Blue). Where'd they all come from for such a low price, you ask? Alright, friends. I'm about to let you in on a very juicy bookish secret-- one you will most definitely thank me for. I only just discovered it recently myself, but you better believe I wasted no time in taking advantage of it. They sell discounted books offered at 50-90% off the original list price. Book Outlet's books are marked down so low because they are from a publisher's excess inventory. The books are unused and in excellent condition, unless they come from the Scratch & Dent section-- my personal favorite section. The Scratch & Dent books show some signs of handling or scratches, but they are structurally sound, overall. The best part is they are even cheaper. Like $2-3 for a hardcover cheap. The only downsides would be cost of shipping and length of time it takes to ship-- but even so, it was cheaper to order those titles through Book Outlet than it was to order them through Amazon with Prime 2-day shipping. Trust me, I checked first before placing the order. And just for the record, I was not paid for this post, and I have no affiliation whatsoever with BookOutlet.com other than the fact that I use it and love it. Have you heard of Book Outlet before? Am I the last one to be in the know? What were your experiences like? If not, do you plan to use the site in the future? I'd love to hear from you. It's so sad we don't have that in France, well I can buy on it but the shipping is a little more costly and at the end it's not as interesting. But it's great! I really want to try Shadow & Bone! I heard great things about it. Hey Melliane, thanks for reading. I'm curious: where/how do you buy your books in France? Hi Nyze. I checked out your blog. You had quite a week! Thanks for visiting. Aaah, so you've finally discovered Book Outlet, eh? When I first started reading your post, I was like what a deal! Then I saw the source, and it clicked. Their selection isn't great for my reading preferences, but their prices can't be beat! Speaking of which, I haven't browsed their site in a while, so I'm thinking I'm due. Hehe! Carmel, yes, I finally discovered it! I'm a huge fan of buying used books, and Book Outlet has the prices of used but with much better quality. I agree, the selection leaves much to be desired, but I'm still pretty excited about it. Where do you buy your books from? I'm a big fan of the series so far. Love me some Ronan. Have you read any of Stiefvater's other books, Heather? I haven't heard of Book Outlet but it sounds like I definitely need to find out more about it! You got some fantastic books! Have a great week! Thanks, Katherine! I only discovered Book Outlet about 2 weeks or so ago. They also had a 15% off coupon for Halloween which brought the prices down even lower. I will definitely be keeping an eye on their inventory. Galleys and ARCs and Proofs, Oh My!